This is an incredible moment of my blogging journey. Ayesha's kitchen crossed 500 recipes. This is a great achievement for me. My 500 th post. Thanking my readers of ayeshas kitchen for your support and motivation that made me to reach this level. Thank u so much friends, from the bottom of my heart for all your appreciations and suggestions. Let it be a very simple, quick, easy chocolaty treat with handy ingredients. Right? 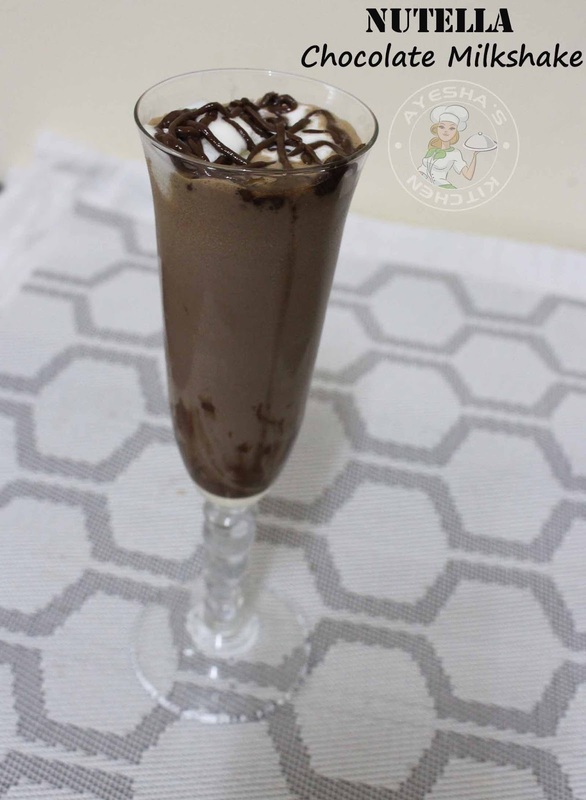 Yes, here is my recipe showing how to make a simple nutella chocolate milkshake recipe. Beat the summer heat with this simple drooling chocolate milkshake. This insanely delicious chocolate nutella milkshake can be topped with your favorite sweet treats that you love. Here i stack my milkshake with a scoop of vanilla ice cream and piped with melted chocolate. Keep ready two serving cups. Decorate the sides of the cups with melted chocolate (optional). Now add nutella and milk in a blender. Blend well. Pour into the prepared glasses and stack it with a scoop of ice cream. Finally garnish with chocolate shavings or drizzle some chocolate sauce. NOTE - When you want to pipe melted chocolate, put some broken chocolate in a plastic piping bag. Tie the end. Keep this piping bag in a cup of hot water to melt. Once melted, snip a small hole in one corner and start your piping art. ..a simple tip for melting chocolate for piping.